Kylea Taylor is a senior teacher with GTT. In 1995 she published The Ethics of Caring: Honoring the Web of Life in Our Professional Healing Relationships. Twenty-two years later she has re-organized, re-written, changed the subtitle provided many new quotes and references, and added 80+ pages. The Ethics of Caring presents a model that first suggests and supports self-compassion, then gently guides self-reflection about unconscious countertransference that often occurs in the main areas of human life. 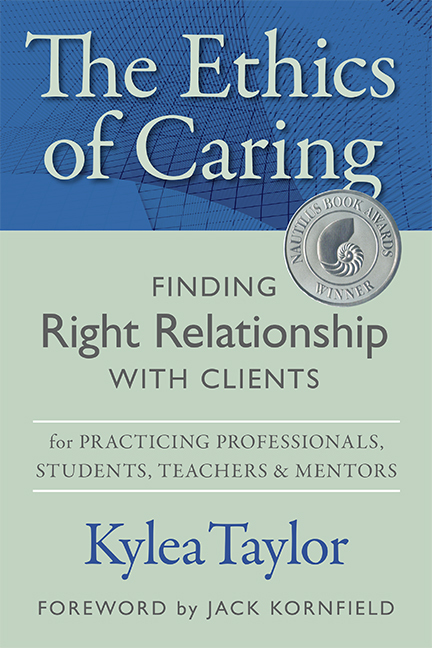 The Ethics of Caring is a unique ethics text designed to guide the self-compassionate self-reflection of both students and professionals (therapists, clergy, hospice workers, bodyworkers, educators, medical professionals, mentors, and other caregivers) toward understanding human motivations and countertransference, finding professional right relationship, and making good choices with clients. Highly recommended for Holotropic Breathwork facilitators and sitters.